To come out of the ocean. Her high-boned cheeks were smiling. For the hand of his daughter." I stopped all my wandering. And there was no other house in sight. And dry off by the fire. Cooperation with a partner can only take us so far. At some point our cooperation must be upgraded to become an irrevocable commitment. A committed relationship can deepen in ways that a cooperative partnership cannot. 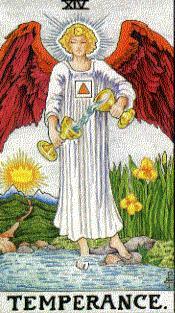 The lesson of Temperance is that "the whole is greater than the sum of its parts," and that in order to become whole we must accept with equanimity whatever experiences the process of re-integration requires. If you'd only give it half a chance.